This post will guide you how to use Excel DMIN function with syntax and examples in Microsoft excel. 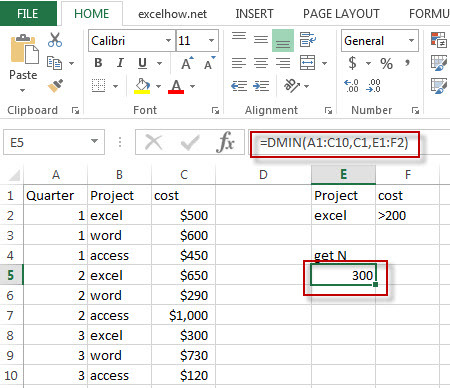 The Excel DMIN returns the minimum value from a database or a column of a list that matches the specified conditions. The DMIN function is a build-in function in Microsoft Excel and it is categorized as a Database Function. The DMIN function is available in Excel 2016, Excel 2013, Excel 2010, Excel 2007, Excel 2003, Excel XP, Excel 2000, Excel 2011 for Mac. Database -This is a required argument. The range of cells that containing the database. Field – This is a required argument. The column with database that you want the minimum of. Criteria – The range of cells that contains the conditions that you specify. The below examples will show you how to use Excel DMIN Function to find the minimum value from a column of a list or database that matches a given criteria. Note: The above excel formula will find excel project and its cost is greater than 200, then return the minimum one(300).